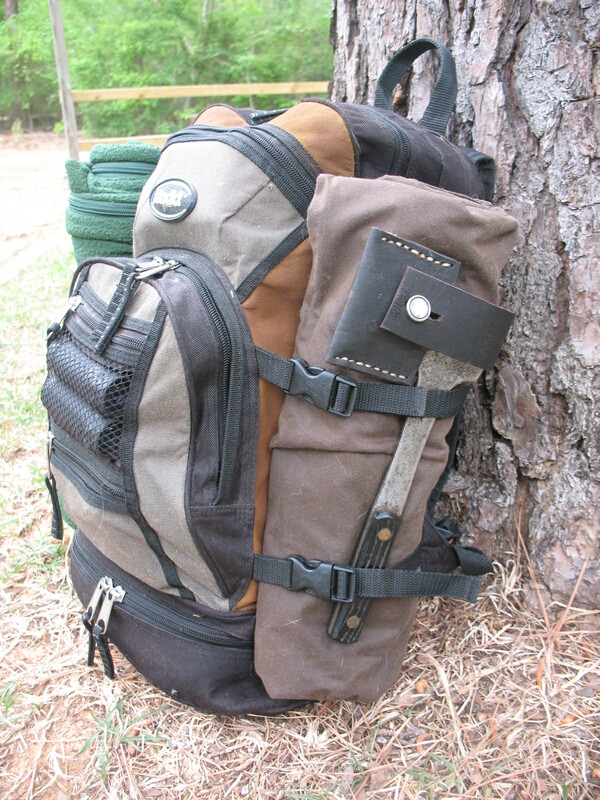 The rest of my gear is carried in, or on, a small back-pack; what some people refer to as a day pack. 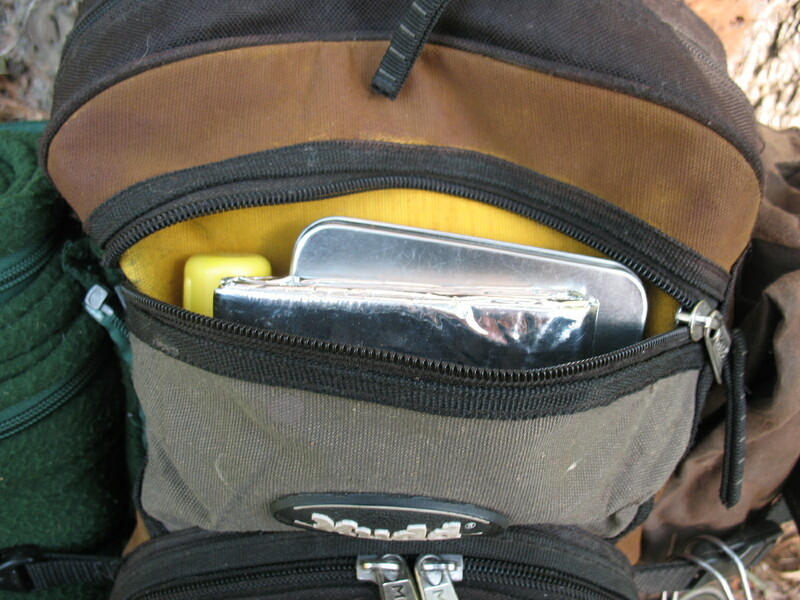 The pack has several different compartments and pockets. It also has some straps for tying things to the outside. Starting on the outside of the pack, I have a fleece bag strapped to the left side of the pack. 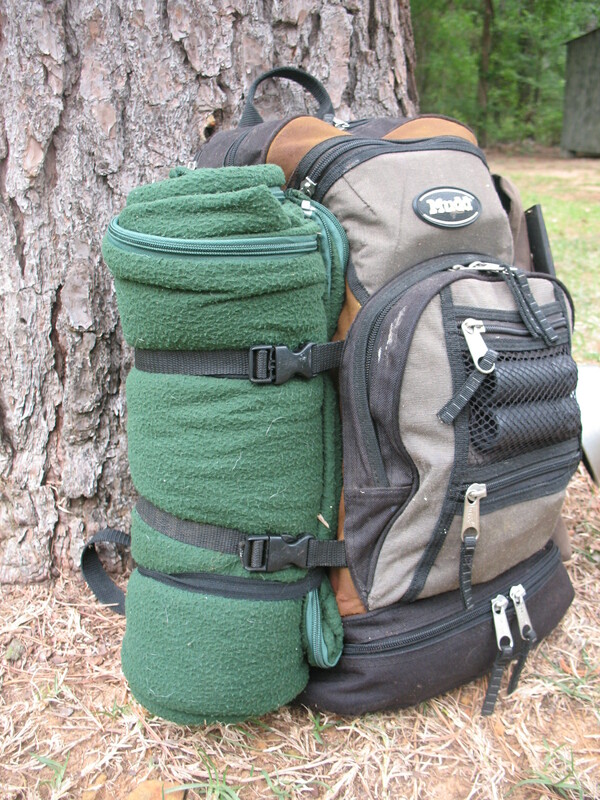 The fleece bag is like a blanket that is folded in half with a zipper along the side. It is adequate for warm to cool weather sleeping, but too light for cold weather. To make the bag comfortable is cold weather I put a foot of pine needles under it and a foot of pine needles over it. On the right side of the pack I have strapped on a small oil-cloth tarp. This tarp is six by seven feet and can be used under the fleece bag as a ground cloth, folded over the fleece bag for extra warmth, or rigged as a shelter in rainy weather. Strapped on along with the tarp is a light-weight hand axe with a leather sheath. I also hook a Sierra drinking cup to one of the straps that secures my tarp. There are four outside zipper pockets on the pack. 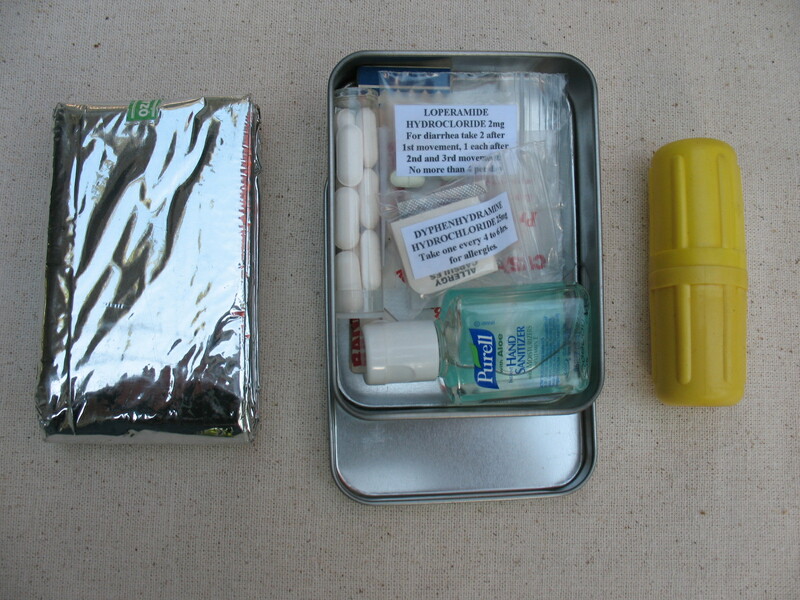 The top pocket holds an emergency solar blanket, a small first aid kit and a snake bite kit. 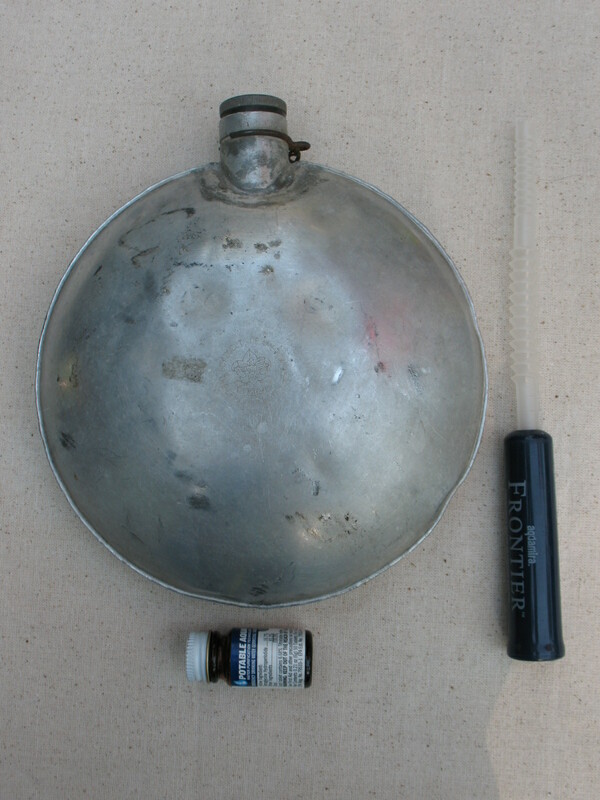 The largest pocket holds a flat, one quart, Boy Scout canteen, a water filter straw, and a bottle of water purification tablets. 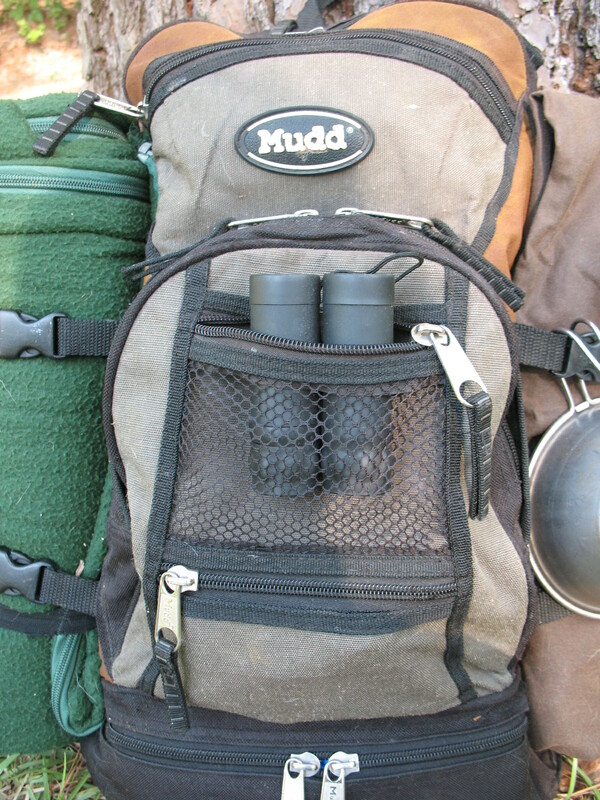 A small mesh pocket holds a pair of mini-binoculars. The bottom pocket on the pack is where I keep stuff having to do with light and fire. 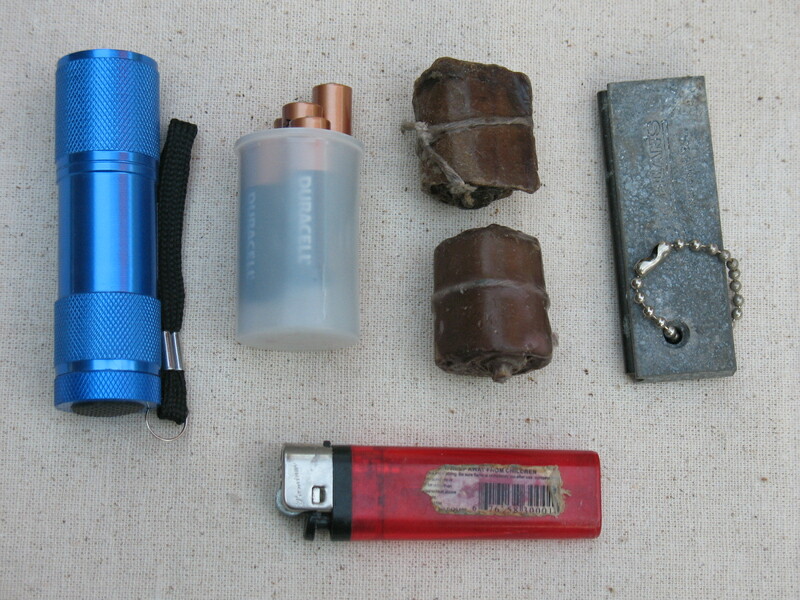 It holds a cigarette lighter, a magnesium bar with flint striker, two paraffin and sawdust fire starters, a small LED flashlight, and a tube of six extra AAA batteries. The bottom of my pack has a compartment in which I keep a Frog Togs rain suit. This is a great rain suit because it breaths so you can wear it without breaking out in a sweat. 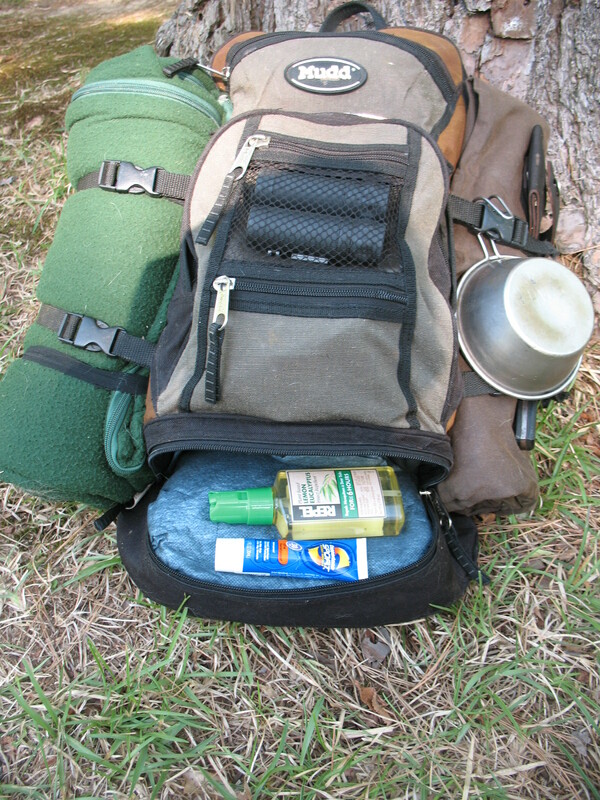 I also keep a bottle of insect repellant and a tube of sunscreen in this compartment. 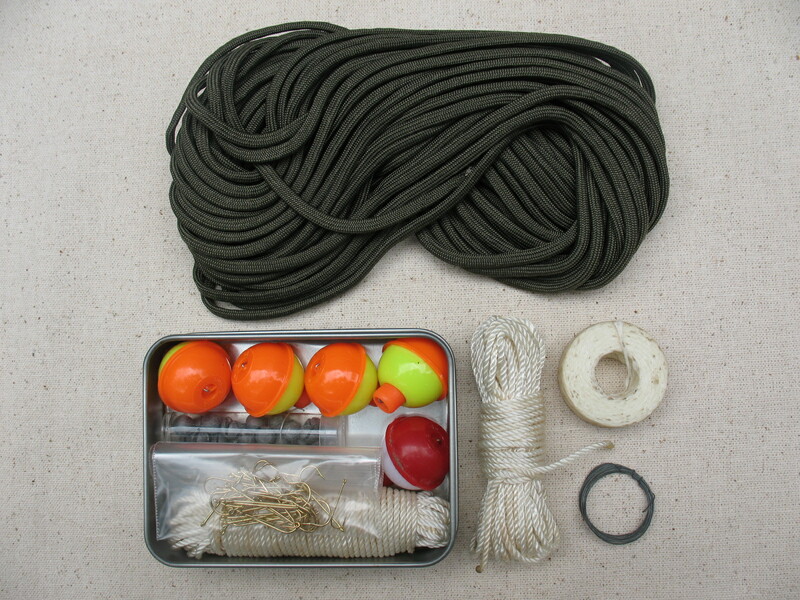 The main compartment of the pack has an inside pocket in which I keep a small fishing kit, 50 feet of parachute cord, some nylon twine, a ball of linen string, and some snare wire. 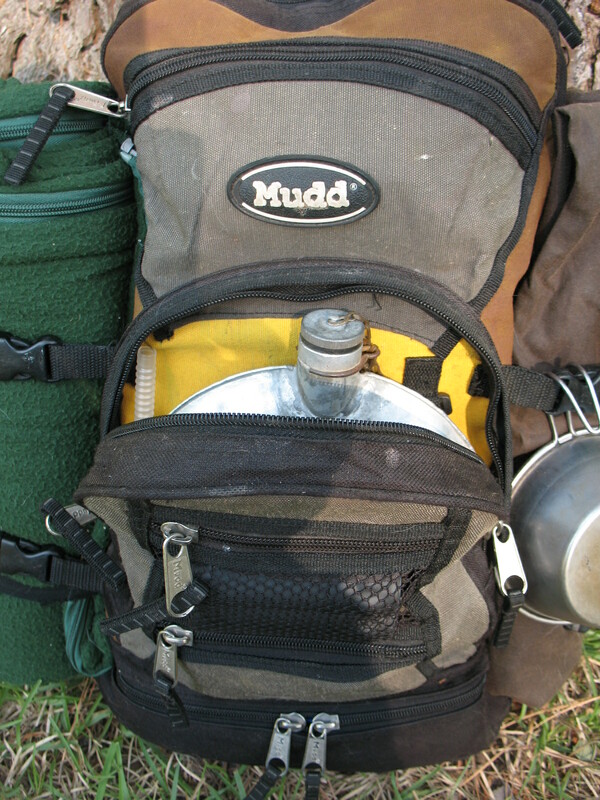 Inside the main compartment of the pack I carry a small sheet-steel cook pot and three stuff bags. 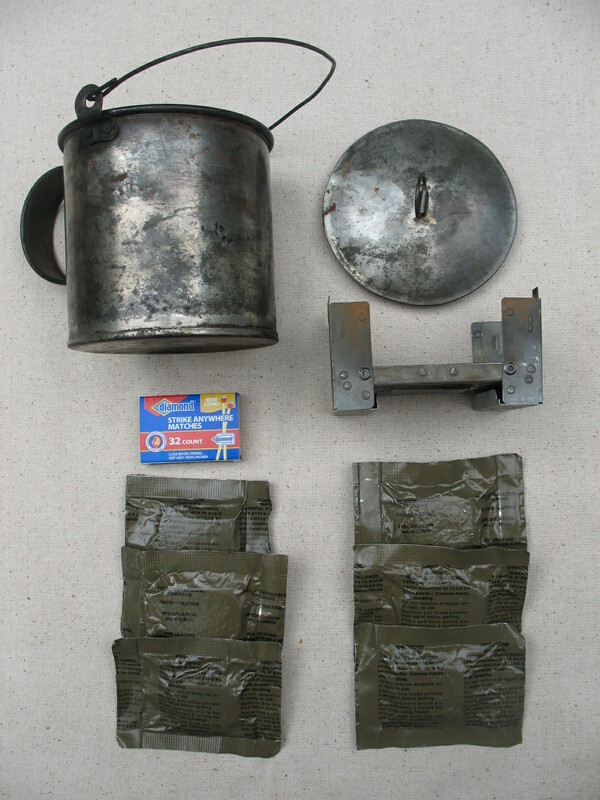 Inside the cook pot is a folding pocket stove, six fuel tablets, and some strike anywhere matches. 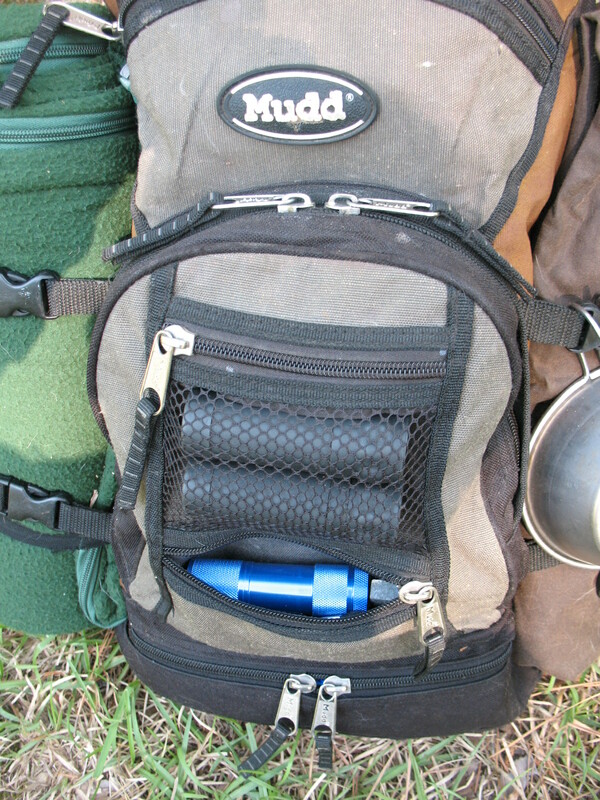 Three stuff bags inside the main compartment hold the rest of my gear. One bag I call my “hardware bag.” This bag holds a gun cleaning kit, a metal gun oil bottle, a small file, a whetstone, a multi tool, and extra ammo. 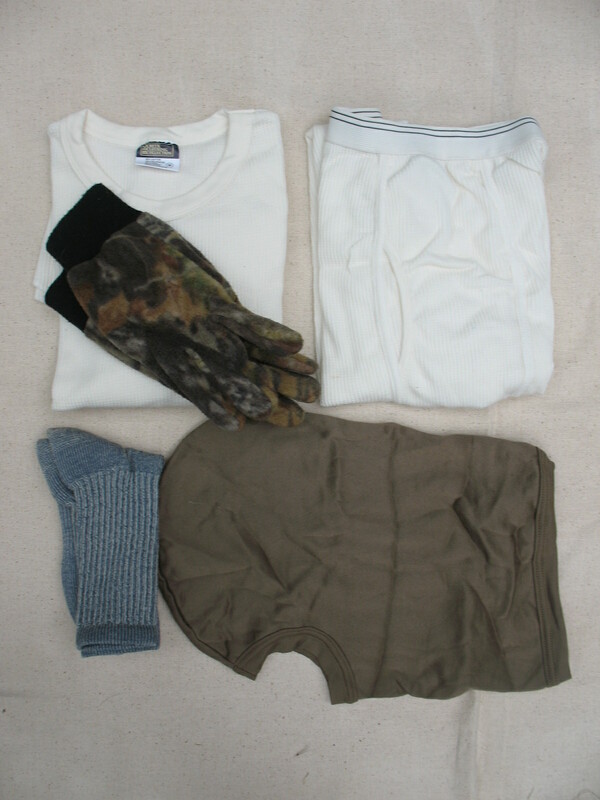 My “clothes bag” contains a pair of gloves, a pair of wool socks, thermal underwear, and a balaclava hat. I also have a P-38 can opener and a spoon in my food bag. 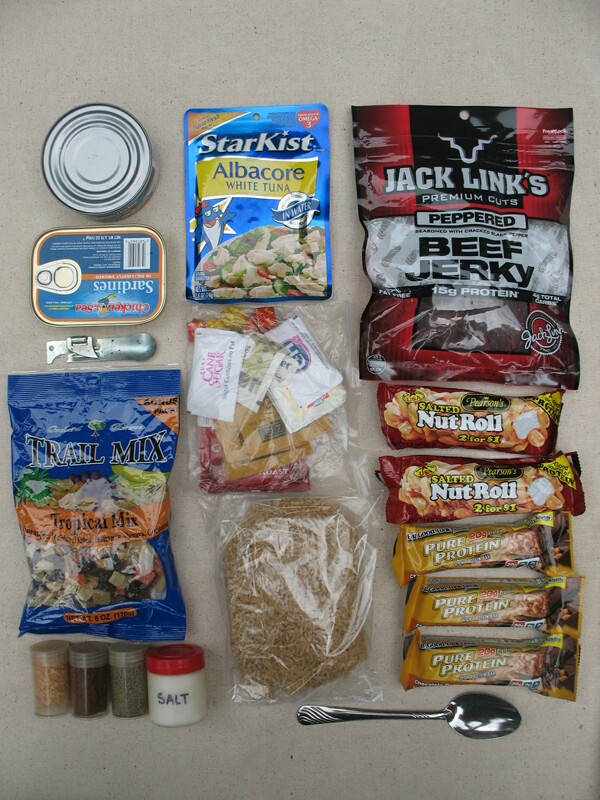 I carry four plastic bottles of spices in my food bag to use in the preparation of any fish or game that I may take. These spices include salt, black pepper, garlic, and chili powder. 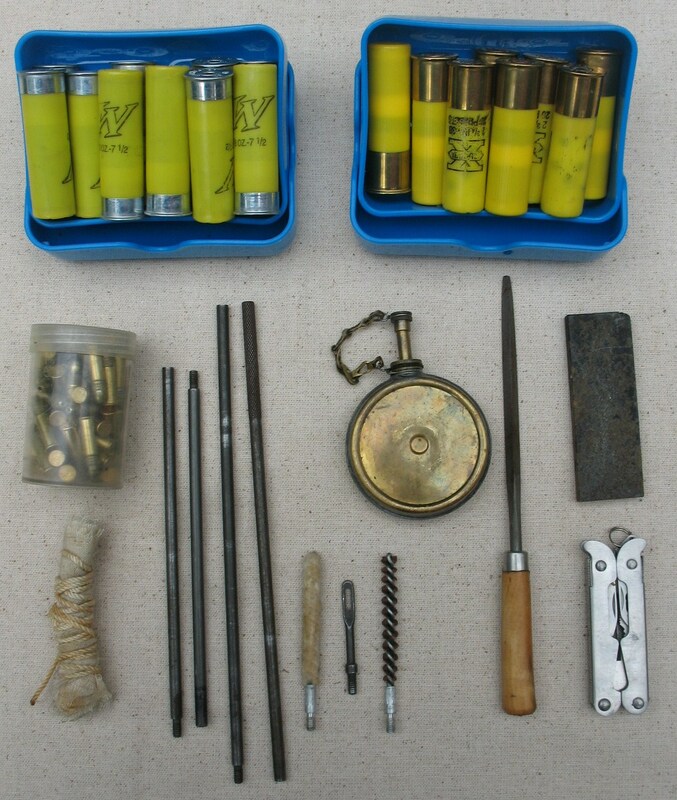 I find that with this gear I can travel light, set up a comfortable camp, and hunt and fish for additional food. This is the gear that works for me.